For Immediate Release: Posted On 10/1/2015 By Industrial Magnetics, Inc.
IMI’s new steel sheet metal fanner, the Sheet Seeker®, revolutionizes traditional magnetic separator designs for a 60% decrease in weight and greater portability between metal stacks. Magnetic sheet separators are used to separate, or fan, stacks of steel sheet metal. When a large magnet is placed against the edge of a stack, the magnetic field forces the steel sheets to fan, making it easy for either an operator or an automated material handling system to destack only one sheet at a time. The Sheet Seeker features a patented, sliding mechanism that allows the powerful rare earth magnetic circuit to index down automatically as metal sheets or blanks are removed from the stack. By focusing the magnetic circuit only where it’s needed, a 60% reduction in the overall weight of the unit was achieved, while maintaining the same fanning strength. 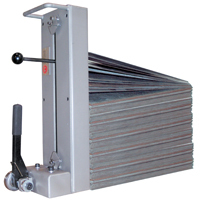 Capable of fanning 30 gauge sheets to 3/16” plate, the Sheet Seeker is available in 12” – 24” heights and is constructed of durable stainless steel. All models feature a convenient carry handle for user-friendly transport and safe and efficient mid-stack changeover of blanking lines. Custom designs and options are available upon request, including an on/off magnetic base in place of a standard mounting bracket for fast and easy setup.